It's been three years in the making so I was most excited on Monday when Liz Canning made the Kickstarter campaign live to support her crowdsourced documentary LESS CAR MORE GO. Liz is the real deal, people. A documentary filmmaker, mama of twins, and cargo bike enthusiast, you can tell just how much vision and time it has taken for her to put this campaign together. Imagine the hours combing through all of our submitted video footage and coming up with an engaging, cohesive story about how cargo bikes make our lives better. She's got interesting history and interviews in there and a bunch of regular folks who just like riding their cargo bikes. Liz has also been working on this project, all self-funded, for the past three years. It's time. It's time. $40,000 is an ambitious Kickstarter goal, however, it is quite modest when talking about a film budget. 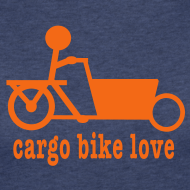 It's been exciting to see how the cargo bicycling community has rallied around to support this film but we needs others to help us out. Please consider giving. Also, consider sharing this campaign far and wide. Thanks so much and happy riding.